Eumundi is a small town and locality in the Sunshine Coast hinterland in the Sunshine Coast Region, Queensland, Australia, 21 km south-west of Noosa Heads and 118 km north of the state capital, Brisbane. It is located just off the Bruce Highway. Nearby towns are Yandina and Cooroy. At the 2011 Australian Census Eumundi recorded a population of 1,924.Eumundi is very popular on the coast for its bi-weekly farmer's markets. 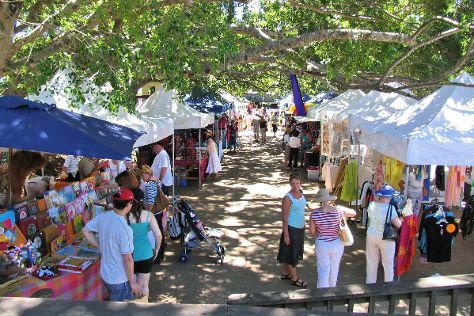 The marketplace is full of locally-made produce, which has made Eumundi and the surrounding area a haven for small businesses.HistoryThe town name is thought to be derived from "Ngumundi" or "Huomundy". This is the name of a local Aboriginal warrior said to have adopted escaped convict Bracefield as his son in 1831.From the early 1850s, most of the area around the Eumundi district was part of three cattle runs: Canando, Yandina and North Kenilworth. In 1867, after the discovery of gold at Gympie, the first road was marked and cleared. By 1879, George Gridley became the first selector to reside permanently in the Eumundi district. This started a wave of new selectors and by 1885, 47 selections were taken up. Some of the pioneers settlers included Fullager, Cowell, Burrel, Ball and Arrundell.In 1882, Fullager selected Portion 110. This was forfeited and the Crown took over. Town blocks were surveyed and divided in 1890. The town's name is believed to come from the Kabi name Ngumundi, the name of a local Indigenous clan leader. The locality's original name was Eerwah after Mount Eerwah; this was changed to avoid confusion with the nearby town of Beerwah. Eumundi is in Sunshine Coast. Add Eumundi and other destinations in Australia to your travel plans using our Australia trip planner.